The Elite HV10 reel is an excellent choice for the budget minded pool owner that wants the option of 360 degree multi-directional maneuverability offered with caster wheels. The HV-10 offers smooth and easy operation every time. Its low profile is specifically designed to accommodate only 17 inches of clearance, allowing it to fit under almost all diving boards, plus the flip down casters allow for easy movement on any deck surface - see specifications below. • Heavy-duty tubing to eliminate roller sagging Pool cover not included. 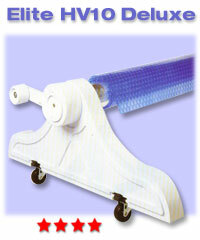 The Elite Strap Kit easily attaches a solar blanket to any Elite Pool Reel System.